Trailblazing marine biologist, visionary conservationist, deep ecology philosopher, Edward F. Ricketts (1897–1948) has reached legendary status in the California mythos. A true polymath and a thinker ahead of his time, Ricketts was a scientist who worked in passionate collaboration with many of his friends—artists, writers, and influential intellectual figures—including, perhaps most famously, John Steinbeck, who once said that Ricketts's mind “had no horizons.” This unprecedented collection, featuring previously unpublished pieces as well as others available for the first time in their original form, reflects the wide scope of Ricketts’s scientific, philosophical, and literary interests during the years he lived and worked on Cannery Row in Monterey, California. 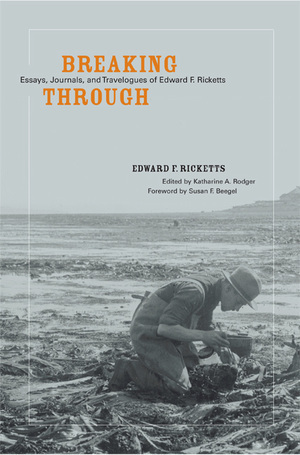 These writings, which together illuminate the evolution of Ricketts’s unique, holistic approach to science, include “Verbatim transcription of notes on the Gulf of California trip,” the basic manuscript for Steinbeck’s and Ricketts’s Log from the Sea of Cortez; the essays “The Philosophy of Breaking Through” and “A Spiritual Morphology of Poetry;” several shorter pieces on topics including collecting invertebrates and the impact of modernization on Mexican village life; and more. An engaging critical biography and a number of rare photographs offer a new and richly detailed view of Ricketts’s life. Edward F. Ricketts co-authored several books, among them Between Pacific Tides (1939), now in its fifth, revised edition and still regarded as the definitive ecological handbook on the California littoral. Katharine A. Rodger is editor of Renaissance Man of Cannery Row: The Life and Letters of Edward F. Ricketts (2002). Susan F. Beegel, editor of The Hemingway Review, coedited Steinbeck and the Environment (1997). 3. The Philosophy of "Breaking Through"
Memoir by Ed Ricketts Jr.